Partly cloudy skies early followed by scattered thunderstorms overnight. Low 57F. Winds SSE at 10 to 20 mph. Chance of rain 40%.. Partly cloudy skies early followed by scattered thunderstorms overnight. Low 57F. Winds SSE at 10 to 20 mph. Chance of rain 40%. A human tote board shows that the Wartburg College Dance Marathon raised $153,307.11 for the Stead Family Children’s Hospital on Saturday, April 6, 2019, in Levick Arena. 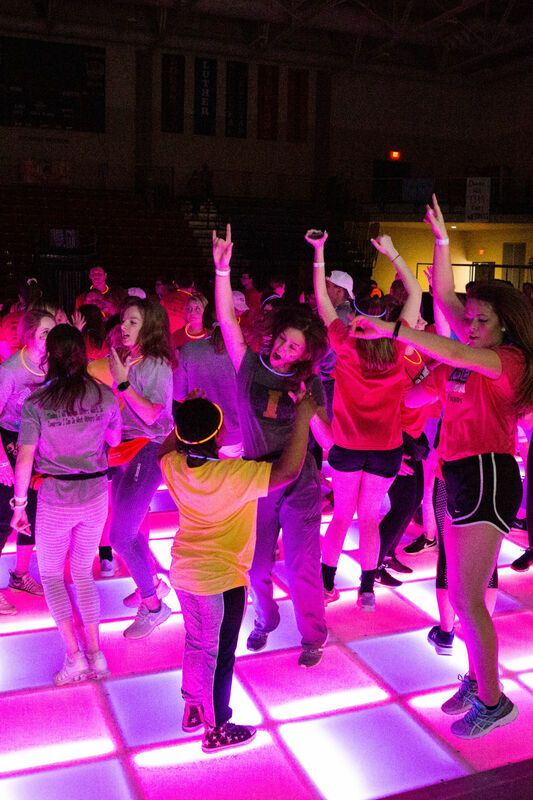 Dancers at the Wartburg College Dance Marathon dance on a lit dance floor on April 6, 2019. Top: Participants at the Wartburg College Dance Marathon get excited when they learn that they raised $153,307 for the Stead Family Children’s Hospital. Above left: Dancers at the Wartburg College Dance Marathon dance on a lit dance floor on April 6, 2019. Above right: Nick Arp and Connor Frerichs were the co-executive directors of the Wartburg College Dance Marathon. Nick Arp and Connor Frerichs were the co-executive directors of the Wartburg College Dance Marathon. Months of fundraising and 12 hours of dancing ended Saturday, April 6, with a big reveal that shocked all of the students dancing “for the kids” as part of the 11th annual Wartburg College Dance Marathon. The 343 registered dancers raised $153,307, smashing the student-led organization’s $130,000 goal and increasing last year’s total by more than 33 percent. All money collected is donated to the University of Iowa Stead Family Children’s Hospital, which is affiliated with the Children’s Miracle Network. In the last 11 years, Wartburg students have raised more than $608,450 for the hospital. WCDM is the largest philanthropic student organization at Wartburg College. “I participate in Dance Marathon because these kiddos suffer more at such a young age than most people will their entire life,” said Connor Frerichs, a senior and Dance Marathon co-executive director. “I want to help them and their families in any way possible. • Thirty-eight students who raised more than $1,000 each, a record for the college. • One student who raised more than $8,000. • A 15-person executive team that raised more than $28,000. • Fifteen teams that raised between $3,800 and $20,000 each. • Two successful “push days” that raised $28,152 and $38,160, respectively. Each dancer is required to raise $120 to participate in the day, which includes games, food, singing and dancing without consuming caffeine. Each hour of the event begins with a “miracle family” sharing how they have been impacted by the services at the Stead Family Children’s Hospital. Several WCDM leaders also helped facilitate mini Dance Marathons at East Buchanan High School and a joint event between East Buchanan and North Butler that collectively raised more than $4,000. “I’m proud of our school,” said Nick Arp, co-executive director of the marathon. “I was really proud that our campus was energized and motivated to raise money for this cause.